Join project staff in to learn about the Bascom Complete Streets Study at either of our two community open houses scheduled this March 27 & 28 at 6:00 p.m.
Thursday, March 28, 2018, at 6 p.m.
We heard you during our round one and two outreach, public meetings, and online surveys. Your feedback was incorporated into the preferred design which will be on display for your review. 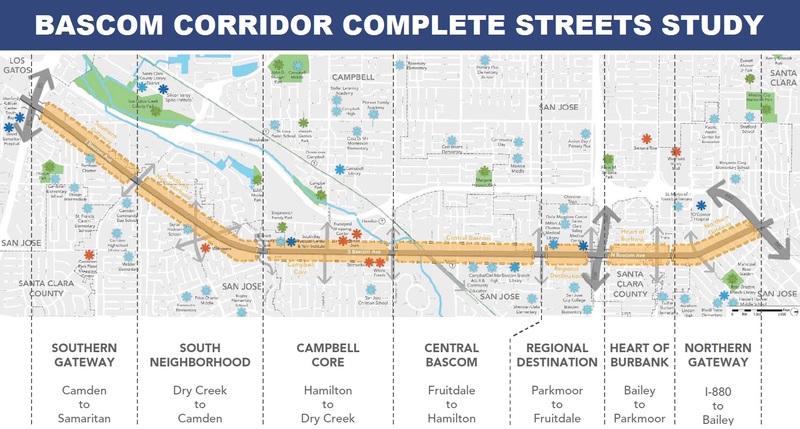 The study evaluates 5.9 miles of Bascom Avenue from I-880 near the Bascom-Forest and Rose Garden neighborhoods in San Jose, past Valley Medical Center, the Pruneyard in Campbell, and down to the Farnham and Ponderosa neighborhoods near SR-85. It includes unincorporated areas of Santa Clara County along the corridor. The purpose of this multi-jurisdictional planning study is to identify opportunities along Bascom Avenue to demonstrate and advance Complete Streets improvements. The study will evaluate transit travel times, signal coordination, signal timing modifications, multimodal access, safety, and connectivity. VTA bus routes 61, and 62 serve the corridor, and VTA's Mountain View-Winchester light rail line and Los Gatos Creek Trail cross Bascom Avenue near Southwest Expressway. This study is a joint project with the VTA, City of San Jose, City of Campbell, and the County of Santa Clara. Please share this with friends, family, neighbors, and coworkers.